A building partially collapsed on Boylston Street in Boston Tuesday. NBC10 Boston Investigators have been looking into the history of the property and found it is long and troubled. Ally Donnelly has more. A building partially collapsed in Boston on Tuesday afternoon, and our NBC10 Boston Investigators found the property has a long and troubled history. Boston Fire Department responded to the rear of 392 Boylston Street where they found plywood and brick had come down from the 4-story building that is under construction. No one was inside at the time, and there were no injuries. Firefighters did evacuate people from the Globe restaurant next door as a precaution, and the city’s inspectional services department responded to investigate the wall failure. 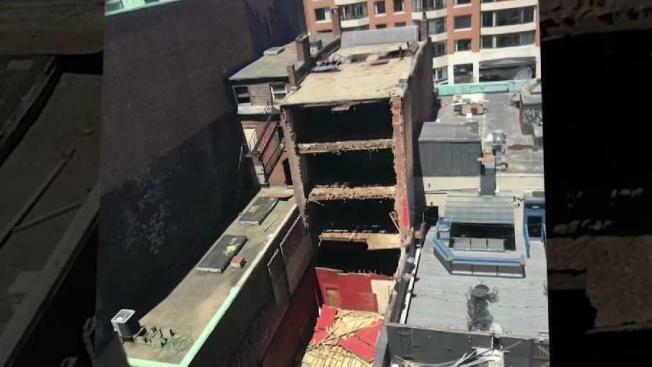 This is the same building where brick crumbled off the front façade back in February, and NBC10 Boston Investigators found that the city has been getting complaints about this building for nearly a decade. In fact, as far back as 2010 the fire department labeled it a problem property with dangerous conditions. It’s a series of three buildings from 392 to 402 Boylston Street. It has been unoccupied for some time, but once housed the Tannery shoe store. When part of the building collapsed onto the sidewalk in February, it narrowly missed pedestrians, according to complaints to the city's inspectional services department. No one was hurt in that incident, either, but since 2010 the city has received more than a dozen complaints of unsafe conditions, including a damaged roof, no fire protections or alarms, and a crumbling facade. The fire department reported “holes in the floors, broken stair wells and structural integrity issues.” The building is marked with red Xs -- warning firefighters about potential hazards. The city has issued a half dozen violations over the years, demanding the property's owners make repairs and bring the buildings up to code under threat of criminal and financial penalty. But it’s unclear at this point if the owners made any changes or if the city pursued any charges or fines. Inspectional services is working on getting NBC10 Boston the information on what if anything the city did to hold the owners accountable. NBC10 Boston also has calls out to the buildings’ owners. Notably, the owners did file a request to demolish the building in April, but that application is pending with the city.